About a week before that, I noticed that one of the irises I had planted in the pots on the front porch back in the spring had sprouted a stalk with buds, intending to bloom. I usually put annuals in these pots, but they get too dry by the end of summer and never last. This year I planted daffodils, hyacinths, and irises in each one – intending to winterize them to come back again and again. I did not think the irises would bloom this year, but one of them did back in May. It was a deep violet. In summer, I added some Asiatic lilies for color once the spring mix had bloomed already. I cut back the dead foliage after a while, but I left the long iris leaves so they could collect as much sun as possible. And I’m glad I did. As I said, back in late August, one of them begin to sprout some blooms. I had no faith in it. It was either going to be too hot or too dry for the buds to open. J and I debated the color if it was to open because the buds appeared to be a light blue. But I knew I had not planted that color in the pots. They were violet and white. I kept watering it just to try to nudge it along, and I’m glad I did. And then on the morning of 9/11, when J stepped out the front door to go to work, there it was. A beautiful white iris had opened. 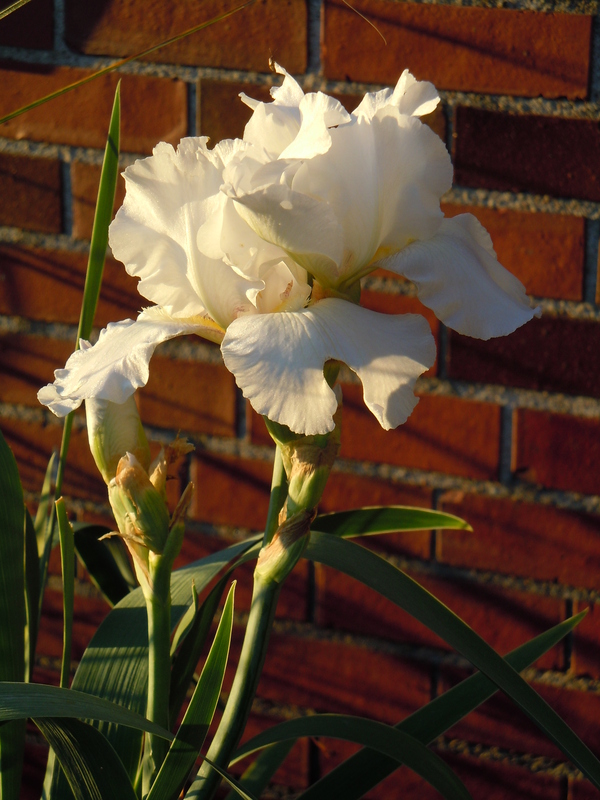 You’ve read me blogging about the white iris before. We planted one two years ago and it has never bloomed, or even grown very big for that matter. But I’ve always wanted to see one. This year I got my wish. It bloomed six total flowers, the last three just this week. The rain beat the heck out of them yesterday, but it made me happy to step out the front door for over a week and see it there. I’ve heard of irises reblooming in the fall, but have never had it happen until now. The white iris is not the first of firsts either this year. 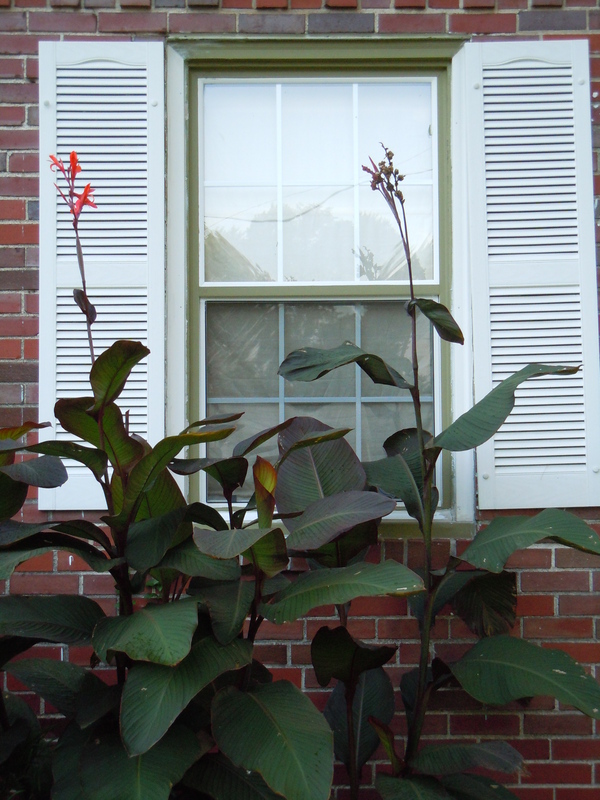 About four or five years ago, I brought some red cannas home from my mother’s house in Tennessee. They flourish in her flower beds and bloom every year. I planted mine in the back of the front flower bed, just below the grand window. I’m glad I planted them up next to the house too because they don’t usually come back so well here in Missouri for some reason. Alas, mine have also never bloomed. Last Fall, they were so thick that I decided to transplant some of them further down to complete an entire row of them as a backdrop behind the front flowerbed. And wouldn’t you know it? The newer ones that had been transplanted bloomed this year – twice! The transplanted portion also grew taller. I have no idea why. They aren’t a very pretty flower, unless of course you have an abundance of them, but it was still nice to finally see ours bloom after all this time. I think I have to attribute this odd timing to the position in the bed where they are planted. The newer ones are closer to the edge of the house and may be getting a bit more sun in that area as opposed to the older ones right in front of the house in the middle. Either way, their foliage gets very tall, right up to the windows and higher, and we love the way they look. Today marks my first Fall post for this year. There just isn’t much going on outdoors in our garden by now that I haven’t already shared with you in a previous year. Usually, the summers are so hot that everything is dry and browning by now. We were fortunate enough to have a very wet and mild summer. Our hosta bloomed forever and are still lush and green. Even our long forgotten herb garden is still lush and full – the bees and butterflies have been enjoying it long after we had our fill. The sedums are a rosey pink now. You might remember my posts about our vegetable garden. It flourished this year too thanks to the mild temps. The tomatoes did not get very big, but there was definitely an abundance of them. Cucumbers and Zucchini also kept coming for weeks. And we even still have banana peppers on the vine as I write this. All a harvest that is definitely come and gone by now in years past. What’s next for us? I’m considering splitting up some of the sedums and transplanting them. There are two large bushes of them in the front bed next to the driveway. When the pampas grass is tall and heavy with rain, it leans over on them. They also are the only sedums we have that turn brown so perhaps they are getting too much sun there. The rest of the sedums throughout the other beds are all pink now with not a bit of brown. I’d like to spread some of that pink around so we can enjoy it more this time next year. Other than cleaning up some of the dead twigs and leaves from the herbs and other plants, our outdoor season is pretty much gone now that the garden has been composted. We have plans to expand the garden another 4 feet for next year, but that can certainly wait. I’ll probably also take a look at some of the older irises and decide if they should be split up as well. That has not been done since 2011. I will probably purchase mums again this weekend or next. I enjoy them for a touch of fall color, but definitely will not try to plant them in the ground this year. I did that last year with five mums after Halloween, and only one came back. It is buried deep in one of the beds and looks very poor. What’s happening right now in your Fall garden? Next Changing History – Emily Dickinson and Dickinstein – Fact or Fiction?